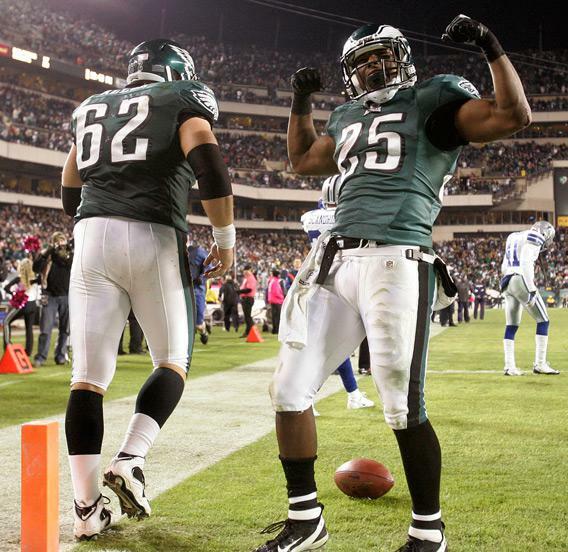 Philadelphia Eagles 2011: Don’t worry, the Eagles will look terrible again soon. Don’t worry, the Eagles will look terrible again soon. Photograph by Rich Schultz/Getty Images. The main thing that blew my mind on Sunday was the speed with which the football pundits raced to declare the Eagles’ ship righted and pointed toward Super Bowl XLVI in Indianapolis. (If, you know, the city had a harbor.) On the basis of Philly’s pantsing of Dallas on Sunday night, the NFL Network’s Steve Mariucci even went so far as to declare the Eagles the best team in the NFL outside Green Bay. Let’s calm down for a minute, Mooch. Yes, LeSean McCoy looked fantastic; much-maligned defensive coordinator Juan Castillo seems to have finally figured out how to deploy Nnamdi Asomugha; and Michael Vick had one of those games that makes you forget that in the next week or two he’ll be in the locker room with smelling salts and/or a walking boot. But Philly benefited from playing an opponent that is its mirror image, prone to wacky turnovers and red zone foul-ups. Mainly, the Cowboys were unable to take advantage of Philly’s inability to defend against the power run. The 49ers stuck to their game plan of force-feeding Frank Gore and came back to beat Philly. The Cowboys, down to a lone healthy running back, took to the air and played right into the Eagles’ hands. Though last night was encouraging, remember that Philly still has the Bears, Jets, Pats, and Giants ahead, among others. I’ll take a wait-and-see attitude on Philadelphia winning the NFC East, much less battling the Pack for a trip to the Super Bowl. As you allude to, Luke, the operating phrase in the NFL isn’t “to each according to his needs” but sic transit gloria. As a Football Outsiders wonk, I feel compelled to mention that luck, in the form of injuries, weird bounces, and blown calls, plays an outsized role in year-to-year and week-to-week results. The Steelers and Pats are certainly good teams, but neither approaches greatness, or even the level of previous versions of those teams from earlier in the decade. Perhaps it will take not luck, but Andrew Luck to end their tyranny of the AFC (though I’m not totally convinced the college star is a sure thing). Still, it’s just as possible that Big Ben gets a catastrophic injury one afternoon and the Steelers turn into also-rans in an instant. If you’ll indulge this fan, allow me to return to the Bengals once more for a moment that encapsulates the fleeting nature of NFL fortunes. Almost exactly one year ago, Pacman Jones made it rain against the Falcons, making a great play to strip Roddy White and return the fumble 59 yards for a touchdown. A little later in the game, he landed awkwardly, suffering a neck injury that put him out of action until this Sunday. The very first time he touched the ball, Jones took a punt back 63 yards deep into Seattle territory. But he pulled a hamstring in doing so and missed the rest of the game. His replacement, Brandon Tate, iced the win with a punt return for a touchdown late in the game. So long, Pacman. We’ll miss you. Surely Tim Tebow’s glory from last weekend will be fleeting, as he got thrown to the Lions in a manner that was fun for A) those of us who have the Detroit D in fantasy, and B) scholars of Roman history. I particularly enjoyed the Silver Crush cackling about his ineptitude afterward, especially the part where an unnamed defender says to Yahoo’s Michael Silver, “Can you believe ‘15’? … I mean, it’s a joke.” I don’t find Tebow’s crusade to be nearly as fascinating as you do, Luke. But to your overall point, would it really be shocking if the Fifteen Experiment ends badly and Brady Quinn leads the Broncos on a winning streak?